“Brazing” is a term that may sound strange to you, but it is very used in air conditioning and refrigeration. In both cases, the installer needs to execute the procedure of uniting the pipes that will receive the gas. This procedure is known as weld and it is in this moment that brazing is used. Brazing is nothing more that the process of uniting materials by using another adding material, also known as alloy. Imagine that you must fix your sink’s pipe, and for that you must connect the pipe to another. In this case, you’ll need to heat up the pipes so that you can put one inside the other and glue them. In brazing, it’s necessary to perform the same process, but we replace the glue by the alloy. The brazing is performed at a very high temperature level of the alloy, but not enough to make it reach it’s fusion point. For that, it’s necessary to understand two basic concepts about the alloy, that can have the capacity of capillarity or wetting, depending of wich material is used. We’ll see now what these concepts mean, so that you can use the correct material according to your needs. Also known as capillary action, is the capacity that a metal in it’s liquid state has to fill the gaps between the grains of the base metals. In brazing, it’s not necessary to worry about these metals, because they don’t merge without an alloy. In other words, it’s like the alloy were the glue necessary to both pipes extremities to unite. Also known as humidification, is the reaction that a metal in it’s liquid state has to fill a surface. As the name implies, wetting is the capacity to “wet” the surface. A quality brazing varies according to the wetting capacity of the alloy. A brazed joint considered good must have at least four aspects: joint project, adding metal (alloy), uniformity of heat distribution and adequate protection with flux or atmosphere. Brazing is used to unite low thickness metal, heterogeneous, thermally treated, among others. It’s used in the many branches of activities, from electricity and electronic industries to automotive and aviation, for example. It is used to unite pipes, sticks, bars and other merged components, when te goal is to have only small deformations. Usually, it’s used in the union of cast iron and steel, but can also be used to merge copper, nickel and their alloys. The light brazing is used in electricity and electronic industries, when merging printed circuits, components and in electrical terminal connections, for example. In industrial processes of high scales of production, such as air-conditioning, refrigerators, radiators, among others, are used stations that perform the brazing process automatically. We know that probably a robot will never have all the necessary skill to intall an air-conditioner with the same efficacy of a human being . So, we can relax, because our jobs are safe… at least for a good while! 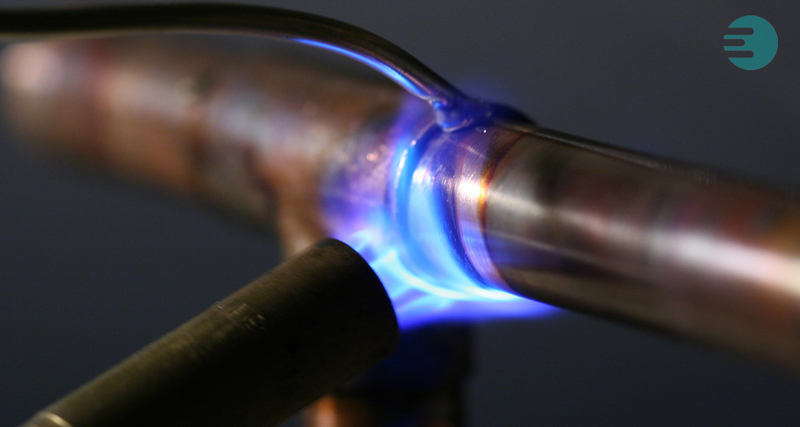 Brazing: The Method For Uniting Air-Conditioner and Refrigerator Pipes by Thales Vinhola is licensed under a Creative Commons Attribution-NonCommercial-ShareAlike 4.0 International License. Based on a work at http://infosolda.com.br/biblioteca-digital/livros-senai/processos/198-brasagem-caracteristicas-do-processo.html.